The first picture ever posted on Booming Back. Not quite sure why. A funny thing happened sometime over the course of the last three years. I can't precisely say when it occurred, there's no single lightbulb moment of realisation, no peak in a graph that I can point to and say, "before here, 'this', after here, then 'that'". While I may not know then 'when', I certainly know the 'what', for at some point during the last three years I lost the ability to write. Obviously I don't mean this literally, pen still moved across paper, keys still clacked on a keyboard, but this was mainly for work. What I lost was the happiness I gained from writing, and with it went the will to write for fun. What I lost was my voice. There were many things that I can point to as contributory factors. In 2012 I started my own company and quickly this took over almost every waking moment. The days were filled with endless business plans and forecasts, sales presentations and investor decks. For the subsequent three years I can comfortably say that the sheer volume of writing done was never higher, as evidenced by a dancing daemon of eyestrain that hops up and down on top of two terabyte drives filled with nonsense that almost certainly will never be seen again by another human being. As the time available and the willpower to fill it with writing for fun decreased, I noticed an increasing tendency to self-censor what I was writing for public consumption. I had spent more than five years developing a style by the time Occupy Dame Street came about, and with it came the decision to emerge from anonymity and allow a number of other publications to republish me. From there came the opportunity to write directly for these sites and a magazine or two, all in a very particular voice and with a focus on calling out what I saw as the wrongs in Irish political culture. 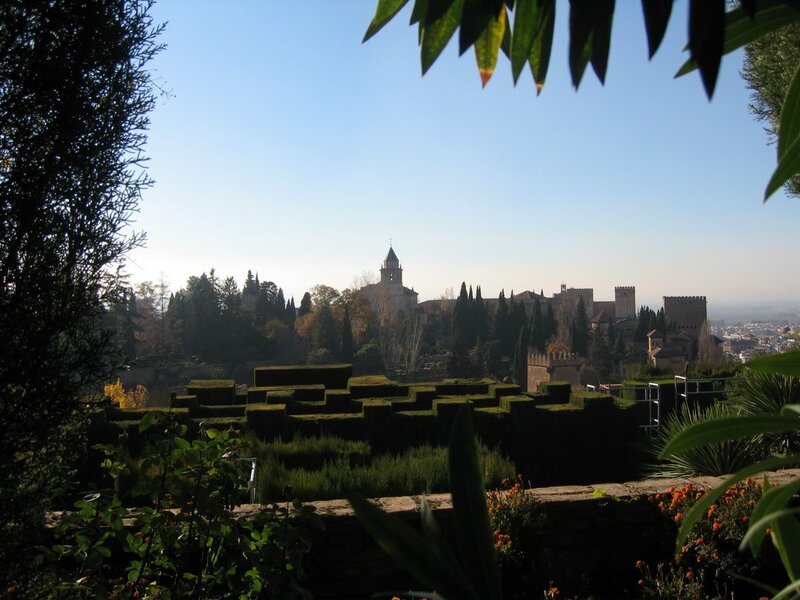 However with an increased focus on my own business, I became overly concerned on the potential negative effects such a distinct voice might have on the perception of my company and its ability to grow. I started to write less and less, and what I wrote about mattered less to me as well, choosing safer topics and veering away from heavier ideas. As I toned down this blog, so too did my desire to keep writing it wane, serving as a constant unhappy reminder of the compromises that I was making. Being grumpy all the time also took its toll, and I found myself pulling back from Twitter for similar reasons. Being consistently and vocally perturbed at the perceived wrong-doing all around does not lead to a healthy mindset. Yes, everything is pretty bad most of the time, but spending those brief moments when it's not recounting the many ways that it normally is, well, let's just say that that's not a very good way to pass your time. The more I didn't write, that harder it became to write, until weeks without posts became months without posts, and it became harder still. I sat down at the start of January to make an effort, to force myself into posting regularly in the hope that, like jumpstarting an engine with a borrowed set of cables and a neighbour's car, the desire to write would ignite within me again and I would somehow reclaim my voice. How did that work out? Like the apocryphal story of Mao's thoughts on the French Revolution, it's too soon to tell. What I will say is that this is the 1,000th post here on Booming Back. Today is also the 10th anniversary of the blog, with the first post being published on February 15th, 2006. Over the last decade I've written an average of more than one post every four days. It hasn't always been consistent, it certainly hasn't always been good, but it has been and is a part of me in a way that is very difficult to explain - even the bits that I'm unhappy with, I'm still happy with. I don't know what comes next. I haven't rediscovered my voice yet, but if I'm very quiet and the night is still I can just about hear it in the distance. Will I find it, or is it just the echo of blogposts past, bouncing around before fading away in to silence? 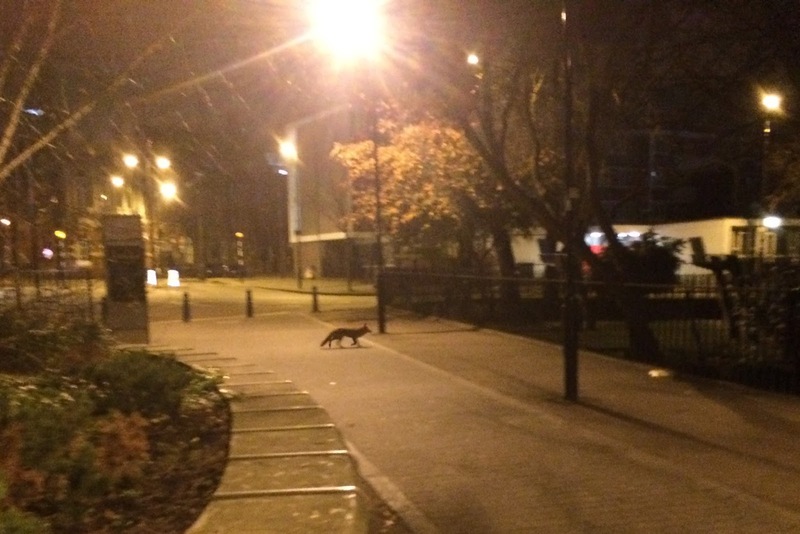 I've seen more foxes in London then I ever have in Dublin. I'm usually too slow with the camera though. Walking home, late Thursday night, early Friday morning. The streets are quiet, the pubs are closed and everyone has gone home. The rain is light, enough to get damp but not enough for an umbrella. Enough to speed you up the closer to home you are. I grew up in a house on the side of a hill. Behind us our garden rose up to meet the hillside, cut grass blending in to wild gorse and bracken. We had a number of cats, wild when it suited them, domesticated when hungry, the hillside was their demesne, but only by day. By night they shared with with the foxes. I was told as a child that the cats and foxes never fought, for although they roamed in similar territory they hunted for different prey and at different times of the day. I pictured the old cartoon about the wolf and the sheepdog, both clocking in at the start of the day and clocking out at the end, no longer adversaries, just two tired workers on their way home, nodding in recognition to each other and to the wolf and dog clocking in for the next shift. I pictured the cats and the foxes as shift workers, meeting each other on the hillside trail as one's day began and the other's ended, nodding collegially with a cheery "morning!" as they passed by. Late night in London, or early London morning, I stop and greet the fox as she heads out to work. "Quiet night so far," I say. She stares at me, from a cautious distance, then disappears through a fence, into the deeper shadows. Sometimes you stare at the goat. Sometimes the goat stares back at you. Unkie Dave stares at goats. The goats stare at Unkie Dave. Neither is harmed in the process. Thanks to a scheduling error on the part of a family member, I found myself this evening the proud possessor of tickets to see Jon Ronson in conversation with Adam Buxton. I enjoy reading Ronson, though occasionally I find his documentaries uncomfortable viewing, his slightly awkward yet very direct interviewing style creating a palatable tension that never quite bursts, just builds and builds. As for Buxton, I was a big fan of The Adam and Joe Show way back when the Interwebs were just a new born lamb, and the chance to see the two sitting around having a chat was an unexpected treat indeed. The evening was funnier than I was expecting, a mix of stories, dialogues and video clips, but as funny as it was at times it was also quite uncomfortable, for both men were brutally honest with each other (and the audience) about their own difficulties, anxieties and personal problems. This openness was disarming, and the awkward directness of Ronson's interview style came across a number of times, leaving you sitting there wondering, "seriously, did he just ask that?". When discussing Buxton's working partnership with Joe Cornish, he asked how Buxton felt when Cornish went off to Hollywood and became a huge success and Buxton was left sitting alone in his garden shed. This wasn't an attempt to goad or belittle him, it was a genuine question from a friend who was meaning well, but wanted to get to some level of truth. Buxton replied with a long and thoughtful answer, brutally honest, which basically said the experience hurt him, despite how much he cared for Cornish. I've seen this effect before in Ronson's documentaries, where the interviewee is somewhat thrown by how unsubtle the question is and yet completely asked without malice, and they answer from a similarly unguarded place in sympathetic response. After watching him for a few hours this evening, I'm pretty sure that's not an interview technique, a style affected to get past his subject's barriers. I think that that is just who he is and how he talks. When you see him on screen chatting with people he is really just being himself, awkwardness and all. Ironically that seems to open people up far more than if they were totally at ease. When he tries to put people at ease, well, that doesn't go so well. His response to Buxton's honesty was, in an attempt perhaps to make him feel better, to share that he himself didn't get over his own sense of self-doubt until George Clooney made a film of his book. I think it wasn't meant as negging or a humblebrag (they're real words, I swear), but seriously, ouch. A very enjoyable evening, but sometimes, as the singer says, the honesty was just too damn much. 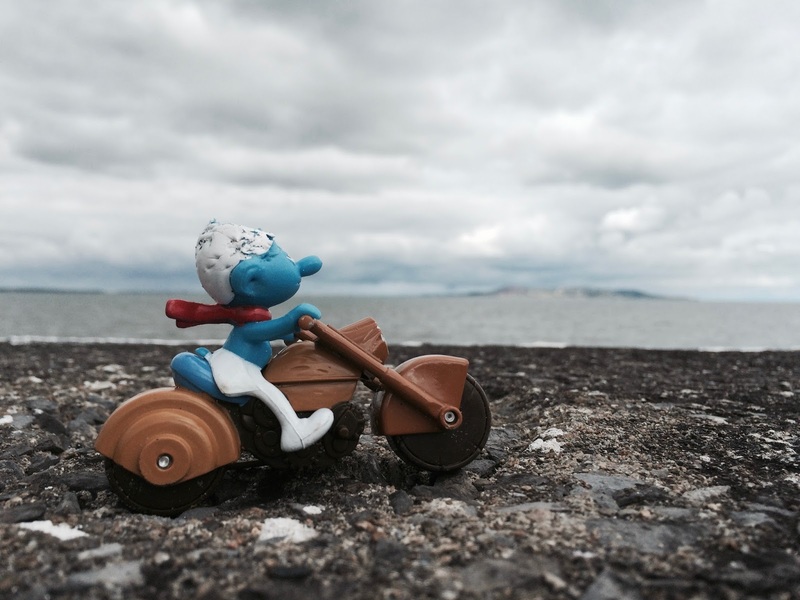 Melancholy Smurf doing his best Easy Rider impersonation. I am quite happy in London, certainly I have not experienced anything approaching homesickness, but I do find it hard sometimes being always surrounded by city. I have no desire to decamp to the countryside, I am a true son of the urban environment, but one of the great features of Dublin is that no matter where you are in the city, in less than thirty minutes you can be on the shores of Dublin Bay and peer out over the grey choppy waters and see out to infinity. You may have to strain your head a bit to see past Howth, Dalkey or Bray, but there, off to your right or possibly left is the open sea, the beautifully nuclear sea. It is nice to be able to take a moment and stand with buildings solely at your back, an absence of artifice and humanity as far as the eye can see (just a bit to the left, or possible off on your right). Once or twice a week in London, I take an night-time walk down to the river, across the Thames at the Millennium Bridge or Blackfriars, or further up at Waterloo Bridge. I walk along Bankside, or further along to Southbank. By day I might travel along the north side at Victoria Embankment. At the river the air is fresher, the people less hurried. The water flows by with a sense of brisk efficiency, though on some days the tide is so low you can walk along the riverbed picking your way through generational layers of discarded Victorian red bricks, the oldest worn smooth and round by time and tide. Crimson-brown boules for the fish to toss. It is a shore, and water, but not the same as standing at Seapoint, or Howth, the end of the South Wall or on Bull Island itself, and gazing out into the grey nothingness ahead. The Thames is like a mirror, one bank reflected back in the other, as you stand you can always see your doppelganger on the other side, staring back. I wonder if they too miss the boundary line. The point that marks the end of the city, and the beginning of elsewhere. 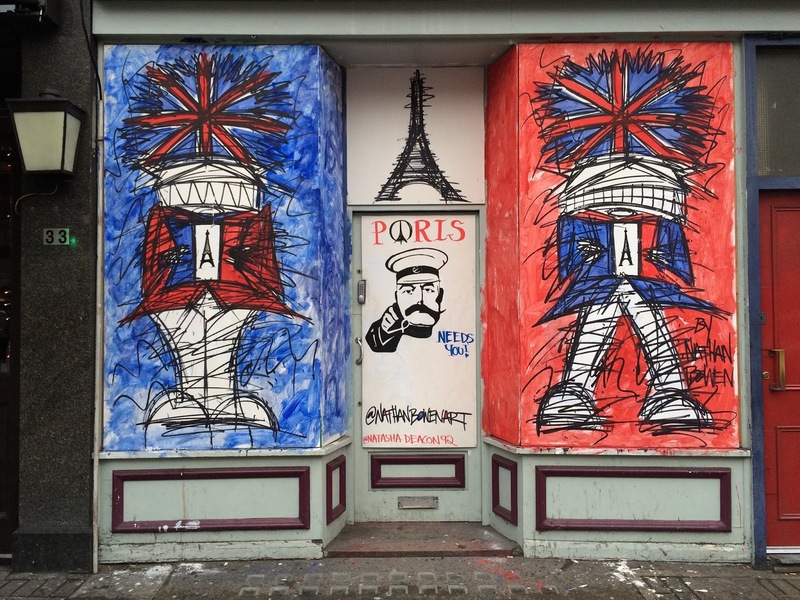 Street art in London, solidarity in the aftermath of horror. Being in France shortly after the horrendous attacks last year it was difficult to explain exactly how everything had changed. There were soldiers and more armed police on the streets, bag searches before going in to public buildings and a general sense of defiance from the populace that life as normal would continue in the face of both existential and physical threats. This was quite similar to New York in the aftermath of September 11th. Aside from the armed soldiers in Grand Central Station and other public areas, by and large New Yorkers just did what New Yorkers are always telling you they do, they just got on with it. But in both places despite the concentrated efforts of the citizenry to 'just get on with it', over the weeks and months after it became quite clear that everything had changed. Not because of the attacks themselves, but because of the way in which governing forces took advantage of the attacks to institute their own agenda, and clamp down severely on any opposition. In the US, the Bush administration rushed through the Patriot Act, invaded two countries, created Abu Graib and Gitmo, legalised waterboarding and torture and killed countless thousands of innocent people around the world in a horror that continues to this day. I remember marching through New York with 100,000 others protesting the war in 2003, and then returning home to see not a single network covering the demonstration. The same number marched that day in Dublin, a further three million in Rome and up to eleven million in all around the world as part of a global protest, and yet on it continued, growing ever worse. Whatever solidarity the world expressed with the US on September 11th, within two years it had evaporated away completely, squandered by the warmongering of the Washington neocons. Police headquarters in Paris, defiant militarism in the cold December night. In Paris today, Justice Minister Christiane Taubira resigned in protest over draconian new legislation. Following on from the implementation of new emergency powers that grant authorities the right to raid houses and detain people without arrest, trial or judicial oversight (used ahead of COP21 to detain environmental activists and prevent them from organising or attending protests), Francois Holland now wants to be able to strip dual-nationality French citizens of their citizenry, if they are convicted of certain crimes. For Taubira, born in French Guiana, this power would demote whole swatches of French society to second class citizens, signalling a distinction between "pure" French and those with a shared heritage. And all of this from a notionally left-wing government. In the days after the Charlie Hebdo attack the whole world marched and proclaimed, "Je Suis Charlie". After last years massacre the world marched again to say, "Je Suis Paris". If the French government continues down this path of Bush and Chaney, hijacking a tragedy to push undemocratic and authoritarian legislation on its people and conducting illegal military operations abroad in an act of shameless and naked disaster capitalism, they too will see the global solidarity evaporate into the night and spend the next decade walking their streets alone. During the quiet spell here on Booming Back last spring, our good friend Ebauche (he of the freezing Crimbo swim) dropped his new album of ambient electronica, Adrift. I say 'dropped', but it's more like he poured it slowly into a large brandy glass, swirled it slightly as the last rays of the evening sun caught it and reflected warm honey across the table below, then gently supped it watching day gradually descend into night as his body slowly warmed from the inside out. It is altogether rather nice. 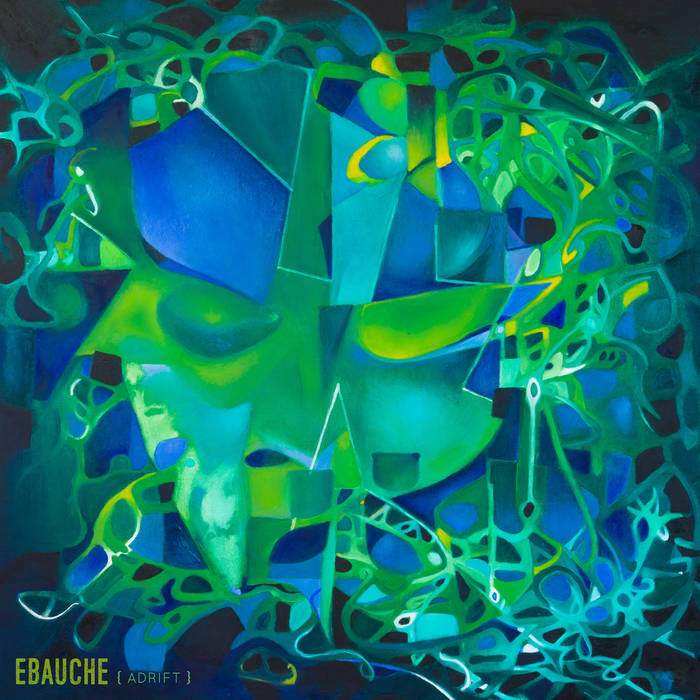 The real-world CD version comes in a gorgeous digi-pack with some pretty stunning and ethereal artwork by Adrianna Snochowska that manages to convey a sense of the journey that Ebauche sends you on. You can listen to a sample below, but if you like it I highly recommend picking up a hard-copy version, and there are a range of cd and vinyl options, as well as prints of the original artwork available here. Politico.ie - What is everyone waiting for? Tomorrow's Harvest - It's no Campfire Headphase, but it's Boards of Canada. Yay!